This resilient self-adhesive f0am tape is a soft, closed cell foam that easily moulds to seal small gaps that can allow noise leakage and is particularly useful for sealing doors and hatches in vehicles and enclosures. Acoustaseal Tape is a soft, self-adhesive, closed cell foam tape designed to seal small gaps against noise, water, dust and draughts and id designed for use to seal any opening that has a hinged cover or door. Because the foam tape is closed cell and soft, once applied using its self-adhesive backing, it will mould itself to seal gaps of 3mm or less and easily conforms to the shape of the structure to which it is applied. The product can also be used to cushion items that would otherwise rattle and so has a variety of uses. 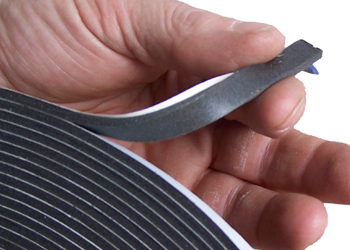 Because of the unique mouldable nature of this foam seal, it can be used to repair existing rubber seals that may have become old and degraded. This is particularly useful for repairing vehicle door seals so they continue to seal out rain, dust and noise.